KRUZENSHTERN entering St. John's Harbour. A russian Tall Ship with about 240 cadets and staff on board looking quite classy. I hear that they enjoyed visiting George Street. 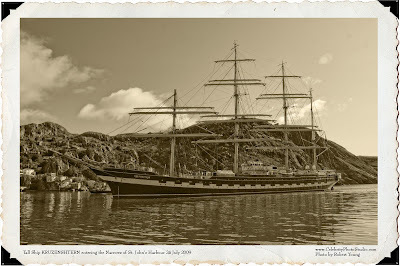 I have neglected this blog for the past couple of weeks so I thought you might like seeing a "Topaz" version of the Russian Tall Ship "KRUZENSHTERN". It graced our harbour for a couple of days this week. 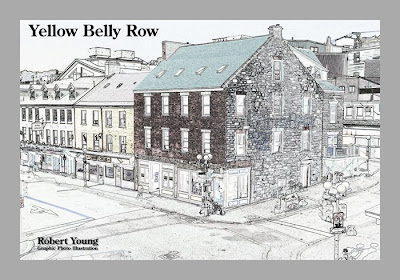 This photo was shot from the roof of the Bowering Parking lot and converted through Photoshop into an Illustration. If you want to build a hotel in Downtown St. John's, then make it look and fit in with these buildings. It will pass council in the first reading. Camera Sony a350, f8 1/250 sec at ISO 100. Extreme long exposures at night can cause the image to look almost like a daylight photo. 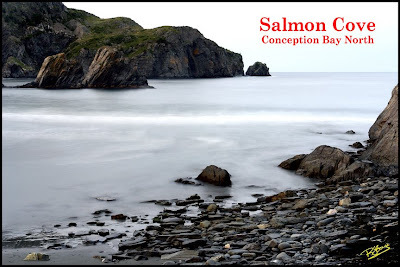 This photo of Salmon Cove in Conception Bay North, Newfoundland is shot at night. You can see a slight orange glow on the left side of the big rock across the harbour, caused by distant street lights. The long exposure also smooths out the gentle waves into a smooth"Liquid Lead" look. Sony R1 ISO 160, 13 second exposure, f16 about 9:30 at night. Industrial scenes can be quite cluttered and distracting. 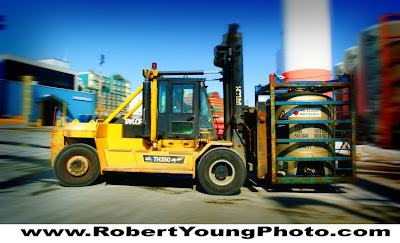 One great way to draw attention to the Fork lift is to shoot it while it is moving. This Panning Action shot reduces the clutter and distraction of the background while emphasizing the subject. This shot was at ISO 100, f8.0 & 1/15 of a second. Enjoy and comment.